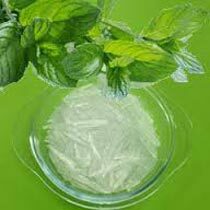 The company is one of the prominent Exporters and Suppliers of premium Menthol Crystals, based in India. The Menthol Crystals, which we provide, are used in diverse industrial applications and thus are highly demanded by the clients. The company has a registered business mark and thus ensures higher grades of Natural Menthol Crystals.